All Flamenco, the first UHD TV channel dedicated to the Spanish Flamenco, has launched internationally with a distribution agreement French operator Orange France. The channel now forms part of the operator’s Spanish bouquet with a potential audience of almost seven million subscribers. The Spanish bouquet comprises eight channels for €6 a month, with Spanish Flamenco sitting alongside Antena 3, Star TVE, Atreseries, Canal 24 horas, TV3 Catalunya, ETB Sat and TVG. 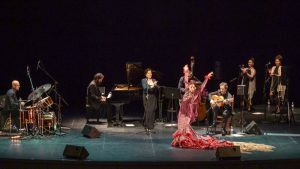 All Flamenco airs a 24/7 line-up targeting at all people keen on singing and dancing who like live concerts, festival performances, recitals and the expression of the culture represented by Flamenco. The channel also includes other music genres such as jazz, soul and blues. All Flamenco is seeking an international expansion into Europe, America and Asia both as a lineal 4K TV channel and as an OTT service with an individual subscription offering to be launched shortly. Launched in 2017, with more than 650,000 subscribers in Spain, All Flamenco is produced and distributed in 4K by Digital Cornucopia, a Spanish distribution company specialised in linear and OTT thematic channels aiming at fan communities with original, multicultural and unique content in 4K picture quality. Digital Cornucopia has already launched a bouquet of seven linear and OTT TV channels. These include PlayIbiza 4K about lifestyle and trends in Spain’s Ibiza Island; Slow Channel, a 4K TV channel featuring relaxing and calming natural landscapes; Garage TV, a combination of competitions and lifestyle shows featuring 360° coverage of the motor world; Feelmakers TV featuring docs, shorts and Animation produced by independent international producers; South American travel channel Viajar; equestrian channel H&C; and All Flamenco. “We aim to reach the extense community of Flamenco fans throughout the world. Flamenco is well known internationally and has a great potential with operators loving the quality content in 4K we propose with over 300 great artists in a year,” said Carlos Navia, CEO of Digital Cornucopia.